Centrally located you will find our spacious 2/BR, 2/Bath ground floor villa situated in one of the finest sections of Seven Mile Beach at Villas of the Galleon, where the beach is only about 100 ft from our porch.Plus 60 inch SMART TV. 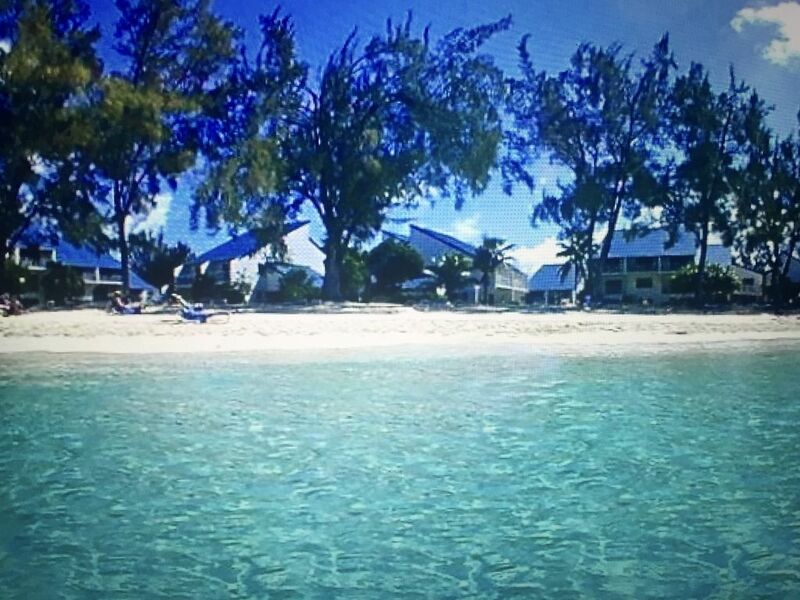 Our complex is located directly on the beach in between two of the best hotels on Seven Mile Beach. It's not by accident that The Ritz Carlton and Westin Casuarina chose this prime location for their hotels. Both hotels have fabulous restaurants, many water sport activities as well as romantic sunset super cruises. Our 400ft of beach frontage with it's powder white sand and crystal clear water offers the ultimate setting for a relaxing vacation with no crowds. Lounge chairs are plentiful as well as many umbrellas scattered on the beach for shade along with our beautiful Casuarina trees. Within walking distance you'll find many more fine restaurants, shops, tours, and a very well stocked supermarket and liquor store. The Villa is air-conditioned with ceiling fans in every room, a porch facing the beach and a barbecue available. There is a separate dining area for six in the den. The Villa is comfortably furnished with a fully equipped kitchen. This includes dishwasher, flat top stove, fridge with ice maker built in microwave, juicer, washer/drier, flat screen TV’s in all rooms, broadband internet & Wi-Fi, iron and ironing board etc. All linens & beach towels are provided. There is a mini bus service going to George Town (3 miles) that stops on the main road every few minutes, few feet from the entrance of the Villas. The main attraction on the Island is the water sport activity, there is world class diving with boats that will pick you up right on the beach, (one of the best diving area in the world), para sailing, wind surfing etc. Activities during the day, visit, Stingray City, Atlantis submarine, Pedro's Castle, Horse back ridding, Botanic Gardens, Cayman Kai (like being on the moon), Tour the Turtle farm, located at the north end of Seven Mile Beach, the turtle farm gives visitors an up close look at Caymans best known aquatic friends. During the evening, more than one hundred restaurants that cater to all tastes, open-air dancing, night clubs, local theatre and cinema. And don't miss the magnificent sunset from the beach. Glad you enjoyed it, hope to have you back soon. Nice unit. Problem with one of the TV. Location fabulous. Couldn’t ask for anything better. Happy to know that our condo was a comfortable and convenient place during your stay on Seven Mile Beach. We also love that there is so much to do within walking distance to the condo.Look forward to having your back again soon. Comfortable and conveniently located. Great communication with the landlord. Glad to know that you had an enjoyable stay, and you enjoyed the location and the vicinity around our condo We would love to have you back! This was our 4th trip to Grand Cayman And Love Love Love it! Narams condo was wonderful, it had everything you could want or need. The patio was so nice to sit on in the evenings and the beach was steps away which was amazing! 7 mile beach is one of the most beautiful beaches we have been to! Take a day trip with Dexter to stingray city! We love it too. We are very Happy to know you enjoyed the location and the vicinity around our condo.Glad you had a wonderful time, and would love to have you back again soon! The property was just as described in photos. We had everything that was needed for comfortable stay. It was clean and owner was very responsive throughout the process. Glad you were comfortable and enjoyed the condo.We love that you can just relax on the beach, read and snorkel and do nothing at all. Look forward to seeing you back again. We have been to Villas of the Galleon for 5 years straight and this year didn't disappoint. Naram was wonderful to deal with and the condo was well-appointed. Really enjoyed being on the first floor so we could "park" our rented SUPs right outside the slider. The cleaning service was outstanding. We have mold and dust allergies in the family and were pleased to see the place was cleaned to perfection before our arrival. They even washed the shower curtains! The dryer did not work. To be honest, I never reached out to Naram because we just decided to skip doing laundry altogether. However, it would have been useful for washing clothes and also towels since we opted to have maid service only once during the week. Also, the master shower has very little pressure. But these things are minor and did not impact our wonderful stay at all. Glad you were comfortable and enjoyed the condo. We also love that there is so much to do within walking distance of the condo. It would be our pleasure to have you come and stay with us again. Activities during the day, Visit, Sting Ray City, Atlantis submarine, Pedros Castle, Botanic Gardens, Cayman Kai (like being on the moon), Tour the Turtle farm, located at the north end of Seven Mile Beach.